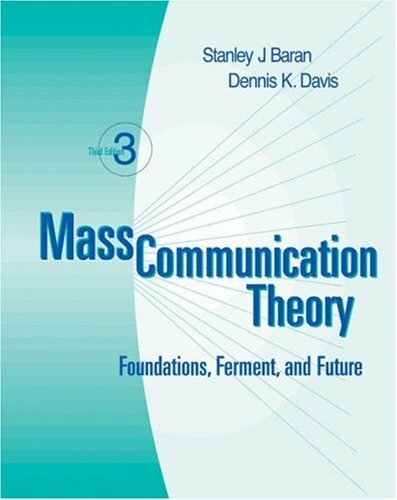 This new edition of Baran and Davis's successful text provides a comprehensive, historically based, introduction to mass communication theory. Clearly written with examples, graphics, and other materials to illustrate key theories, this edition (now streamlined to increase accessibility) traces the emergence of two main bodies of mass communication theory: social, behavioral and critical, cultural. The authors emphasize that media theories are human creations that typically are intended to address specific problems or issues. corporations and organizations, including IBM, ABC, GTE, and Westin Hotels. and news audience research, as well as numerous articles, chapters, and reviews. He has headed divisions of the Association for Education in Journalism and Mass Communication and the National Communication Association. From 1979 to 1980, he was a Fulbright Senior Lecturer at the University of Amsterdam and the University of Louvain la Neuve. His research has won the Donald McGannon Award for Social and Ethical Relevance in Communication Policy Research from Fordham University and the Broadcasting Preceptor Award from San Francisco State University. In 2010, he received the Distinguished Educator Award from the Mass Communication & Society Division of the Association for Education in Journalism and Mass Communication. The award recognizes teaching excellence and influence on pedagogy.